The Decennial Census is conducted every 10 years by the U.S. Census Bureau. It is a count of everyone residing in the United States on the census date of April 1st. The 2020 Census will be conducted on April 1, 2020. You’ll have three options for responding: online, by mail, or by phone. To learn more about the upcoming 2020 Census, visit the Census 2020 page. A good way to start your data search for previous decennial census data is to decide what geographic area you are interested in. Local level data (below the county level) are frequently requested and the geographical level of census tract is recommended. Census tracts cover every part of our state. The next step is to obtain the data that you need. The demographic profiles will provide some basic information from the census. 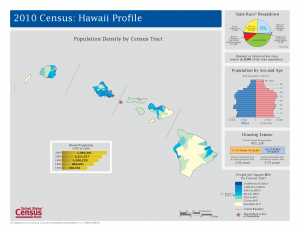 A series of Hawaii State Data Center reports found on the “DBEDT Product Page” may also be a good source of the data that you need.